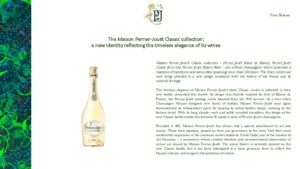 January 2019 - Maison Perrier-Jouët’s Classic collection – Perrier-Jouët Blanc de Blancs, Perrier-Jouët Grand Brut and Perrier-Jouët Blason Rosé – are refined champagnes which epitomize a tradition of excellence and savoir-faire spanning more than 200 years. The three cuvées are now being unveiled in a new design consistent with the history of the House and its cultural heritage. The timeless elegance of Maison Perrier-Jouët’s three Classic cuvées is reflected in their new bottle, presented this month. Its design was directly inspired by that of Blason de France, the Perrier-Jouët prestige cuvée blended from the 1955 harvest. At a time when Champagne Houses designed new forms of bottles, Maison Perrier-Jouët once again demonstrated its independent spirit by keeping its initial bottle’s shape, resisting to the fashion trend. 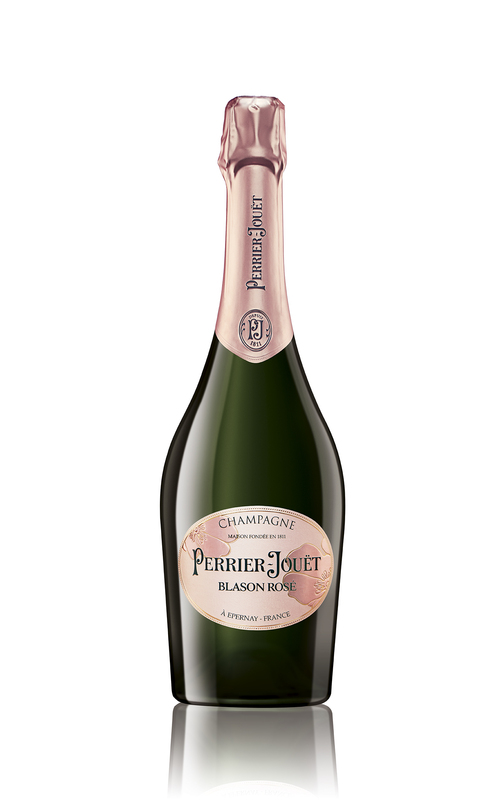 With its long, slender neck and softly rounded shoulders, the design of the new Classic bottle evokes the feminine & modern style of Perrier-Jouët champagnes. Founded in 1811, Maison Perrier-Jouët has always had a special attachment to art and nature. These twin passions, passed on from one generation to the next, find their most emblematic expression in the anemone motif created by Emile Gallé, one of the masters of Art Nouveau – a movement whose creative freedom and unconventional observation of nature are shared by Maison Perrier-Jouët. The iconic flower is naturally present on the new Classic bottle, but it has been redesigned in a more generous form to reflect the House’s vibrant, extravagant interpretation of nature. This singular approach also influences the Maison Perrier-Jouët style. Its founders chose Chardonnay as the House’s signature grape variety – an audacious decision at the time, but one which gave their champagnes an instantly identifiable personality. The perfect illustration of this floral and intricate style – characterized by great freshness, delicate floral notes and aromatic complexity – is Perrier-Jouët Blanc de Blancs, a vibrant, vivacious champagne that is an exuberant homage to the Chardonnay grape. To create Perrier-Jouët Blanc de Blancs, Hervé Deschamps, the House’s seventh Cellar Master, blends wines selected from the region’s finest terroirs with a small proportion of reserve wines in order to ensure consistency of style. After three years’ aging in the cellars – twice the length of time stipulated by the Champagne AOC – the cuvée reveals its full freshness and vitality. Perrier-Jouët Blanc de Blancs is the latest creation by Hervé Deschamps, who has recently welcomed his designated successor, Séverine Frerson. Over the next few years, they will work side by side to perpetuate the style of Maison Perrier-Jouët. With the Classic collection, Hervé Deschamps sets his signature on 20 years of passion and commitment to maintaining the elegance and quality of Perrier-Jouët champagnes. Founded in 1811 in Epernay, Maison Perrier-Jouët is one of France’s most historic champagne houses, but also one of its most distinctive, renowned for its floral and intricate champagnes which reveal the true essence of the Chardonnay grape and an enduring tradition of savoir-faire – an unparalleled expertise of only seven Cellar Masters since its foundation. A boutique house with a family spirit, Perrier-Jouët has been profoundly influenced by its founders’ love of nature and art – twin inspirations which allow it to create exceptional experiences and moments of wonder that enhance everyday life. Since its 1902 collaboration with Art Nouveau pioneer Emile Gallé, creator of the anemone design for its Perrier-Jouët Belle Epoque prestige cuvée, Perrier-Jouët has commissioned work from established and emerging artists including Daniel Arsham, Noé Duchaufour-Lawrance, Miguel Chevalier, Makoto Azuma, Tord Boontje, Studio Glithero and Simon Heijdens, and more recently Vik Muniz, mischer’traxler, Ritsue Mishima, Andrew Kudless and Luftwerk.